A gill net is a wall of netting, hanging in the sea, which is invisible to fish. Fish of a certain size, swimming into a gill net, will get their heads stuck and become snared as they try to reverse. As the fish struggles to free itself, it may become yet more entangled, and is likely to experience fear and panic. Constriction of the gills by the netting may also stop the fish being able to breathe properly. Struggling may result in cuts to the skin and scales. The snared fish may then also suffer attack from predators such as seals, leaving it wounded. Fish may remain like this for many hours or even days. One study found high levels of stress in sea bream captured by trammel net under experimental conditions. A trammel net is a variation of gill net with 2 or 3 layers. Fish were caught in a trammel net for a period of between 10 minutes and 18 hours. Stress levels continued to rise the longer the fish were in the net, even after 12 hours. 28% of the fish died in the net, probably from suffocation caused by constriction of the gills. Another 16% died following release, having incurred open wounds. A salmon caught in a gill net. A Canadian study of found that gillnet-caught Coho salmon were severely exhausted when landed, but that reducing the net retrieval period from 60 minutes to 30 minutes resulted in less “physiological disruption”. Further injury to skin and scales may be caused when the net is hauled in over roller guides and in removal from the net. Loosely attached fish may be gaffed (i.e. their bodies spiked with a hand held hook) to bring them onboard. 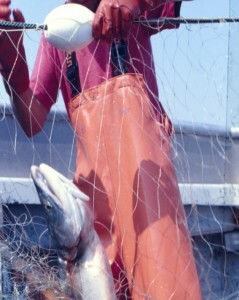 Snared fish are then pulled out by hand or removed by shaking the net. Sometimes marine turtles, birds, and mammals are tangled in gillnets and drown. Cetacean and bird bycatch can be reduced by use of acoustic devices (“pingers”) to make the nets more “visible” to them. 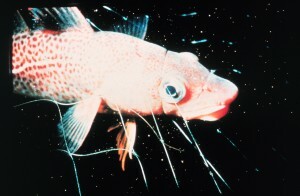 A juvenile codfish caught in a gill net. The numbers of discard fish that die following release from gill nets is likely to be very high in some fisheries. A study in the Columbia River found that survival rates of spring chinook salmon released as bycatch were nearly twice as great for those captured in a 4.5-inch mesh tangle net than those caught in a conventional 8-inch mesh gill net. The smaller-meshed tangle nets tended to catch fish round the snout rather than snaring them. This resulted in less injury and, it appeared, less exhaustion from struggling. However, the smaller-meshed tangle nets did result in larger numbers of bycatch animals. More careful handling of the fish can help reduce the numbers of discarded fish that die. A study of the Kentucky Lake paddlefish gill net fishery in Tennessee found that the number of fish dying in the nets was related to the twine type and water temperature and, as well as increasing with soak time (i.e. the period of time between setting and retrieving the net). Most of the fish (71%) were dead in the nets when the water temperature exceeded 17oC and fish were more likely to die in monofilament nets than in multifilament nets. Lost gillnets may continue to catch fish (“ghost fishing”) for several months or even years. The problem can be partially addressed by constructing nets from materials that deteriorate more quickly and by “retrieval surveys” in which vessels survey fishing grounds to retrieve lost nets. Reduce the time between setting and retrieving the net (the fair-fish fish welfare certification scheme limits capture duration to 30 minutes).